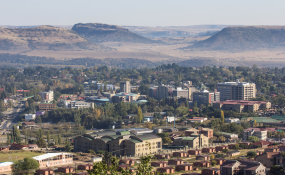 Maseru, capital of Lesotho, seen from Parliament Hill. Windhoek — Southern African Development Community (SADC) executive secretary, Dr Stergomena Lawrence Tax says the slow progress on the implementation of the reforms roadmap and national dialogue in the Kingdom of Lesotho is a concern to fellow member states. She noted the distress at the occasion to mark the end of 38th ordinary summit of the heads of state and government of the regional bloc in Windhoek on August 18. Dr Tax stated therefore that the summit has urged the Kingdom of Lesotho and all stakeholders to ensure that the National Leaders Forum, scheduled for August 23-24 go on as planned and take on board all concerned parties including those residing outside. "The summit resolved not to entertain any further delays in the implementation of reforms and national dialogue and called on SADC member states to take necessary measures against those with intentions to stall progress," she said. The Kingdom of Lesotho has thus been asked to put in place a programme with clear milestones for the implementation of priority activities on both the reforms roadmap and national dialogue. Dr Tax said the summit also commended President Joseph Kabila and the government of the Democratic Republic of Congo for upholding the constitution of the republic to usher in polling in December. She said the summit also commended the government of Madagascar and political stakeholders for reaching an agreement that facilitated the appointment of the new Prime Minister Christian Ntsay as well as the formation of a consensus government. Member states among them; Angola and Zimbabwe were also praised for holding elections since the last summit. "The summit congratulates President Joao Manuel Goncalves Lourenco and Movement for the Popular Liberation of Angola party for winning the elections and call upon stakeholders in Zimbabwe to remain calm while legal process regarding the elections outcome are being considered by the courts."